It says a lot when somebody gets up at 6 a.m. for the passion of the music,” said a slender man with graying hair. After speaking, a smile drifted across Hal Abrams’ face. For the past five years, he’s worked to create his idyllic radio haven. Even though he was the host of the nationally syndicated Animal Radio, he was still looking for something else. HEY, MR. DJ: Radio host Mr. Bill looks at what selection to play next in 97.3 The Rock’s studio in Morro Bay. Five years ago Abrams founded 97.3 The Rock, a local radio station in Morro Bay. Abrams started in commercial radio 30 years ago in LA. Since then, his career made him traverse the country from Virginia to Alaska, before moving to Morro Bay. His first thought was to start a pirate radio station—an illegal and unlicensed broadcast. But as he began to research, Abrams decided to go with a licensed station backed by the listeners. The community of Morro Bay welcomed the station just as the station welcomed the community. Abrams has welcomed all volunteers to host their own show about any topic they wish to. One show is about pharmaceuticals, another about dog training. There is even a show with a man called Old Guy John where he just has conversations with people. “It’s a melting pot of the community and passionate people,” Abrams said. The Rock exists on the basis of volunteers; no one gets paid. The volunteers are all from the community. It’s the kind of radio station where you could hear your neighbor on it, Abrams explained. Hyperlocal radio is what makes The Rock unique. One of the local hosts, Mr. Bill, has been in San Luis Obispo County for 45 years. Mr. Bill’s passion for music began when he was 15 and he bought his first albums from Boo Boo Records. 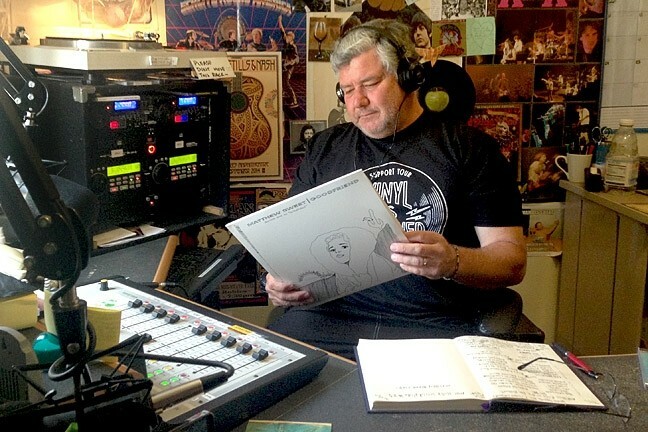 While most radio hosts use smartphones and other technology to play music, Mr. Bill strictly uses vinyl records—he said he quit the internet 2 1/2 years ago. All the music on his show is played from his personal collection of records he’s gathered for the last 35 years. He anticipates the ending of a song so he can smoothly put on another record without any listener noticing. “This is my church, my spiritual place, and one of the highlights of my week,” he said. On Friday, May 13, The Rock radio station will be hosting a fundraising concert at Morro Bay Vets Hall at 6 p.m.
More than $18,000 was raised for South County residents facing homelessness during a recent dinner at Fin’s Seafood Restaurant in Grover Beach. Every penny spent by patrons during Fiesta at Fin’s on Cinco De Mayo was donated to the 5 Cities Homeless Coalition by Fin’s owner Bruce Van Vort and his employees, who donated their tips as well. Funds raised will help provide housing and meet the immediate financial needs of families who are homeless or facing eviction in South County. A portion of the proceeds will also help Lucia Mar’s Families in Transition program supporting homeless youth. This week’s Strokes&Plugs was written by intern Olivia Doty. Send comments and suggestions to strokes@newtimesslo.com.